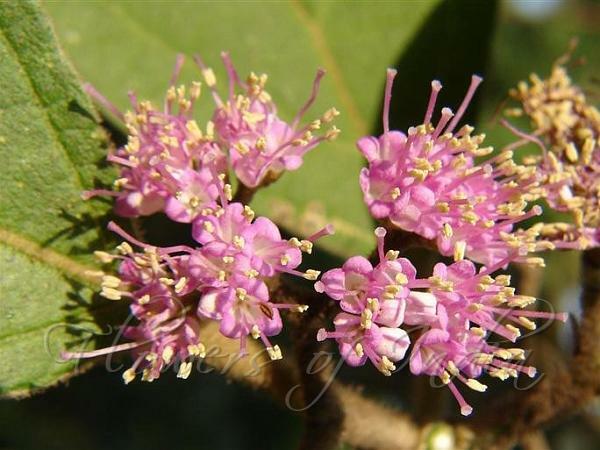 Velvety Beauty Berry is a large shrub or small tree about 5 m tall. Bark grey, smooth. Branchlets are quadrangular, densely velvety. Leaves are simple, opposite, carried on stalks 2.5-7.5 cm long, densely white velvety. Leaf blade is 10.5-25 x 5.5-15 cm, elliptic to broadly elliptic or ovate, tip pointed to long-pointed, base narrow, thinly leathery, glaucous, densely white velvety beneath. Secondary nerves and reticulation are impressed above, midrib raised above. Secondary nerves are 6-9 pairs. Inflorescence consists of branched cymes in leaf axils. Flowers are purple, stalkless. Fruit is a round drupe, black, shining, 4 pyrenes; seeds 3-4. Velvety Beauty Berry is found in open disturbed evergreen to semi-evergreen forests in Peninsular India and Sri Lanka, and throughout Western Ghats, up to 1400 m.